Looks like perspective and balance are on the menu today. Irwin - what a chum he is. I'm a hale fellow well-you-haven't-met. Hi ya, looking forward to Mr. Strausbaugh on your show today! What a fine radio I am listening to the show on today! Which is smarter, Jack - your phone or your radio? And how is the guy listening to it? Computers are only as smart as the people who build and program them. Unless it's that super smart murderous computer from Terminator 2. Or Colossus. He was a problem too. 46% of people eligible to vote didn't. Voters are only as smart as the people who build and program them. In a reader's review of the classic book "How to Lie with Statistics": "When all else fails manipulate the data." Ooh, I love that book. Also "1066 and All That." I love that book too. This was "Dewey Defeats Truman" but with HTML5 and CSS3 responsive graphs. What, you added a "Format" column to your playlist? When I worked for the NYC DEP, I saw some scans of old engineering as-builts of some Manhattan sewers from the 1850s. Just reserved this book at my library. Great interview. You can see Dan Sickles's busted leg bone at the National Museum of Health and Medicine (formerly Army Medical Museum)--it's on display there today, yes. Please ask about minstrelsy and play some tunes. The Beecher Family lived across from Mark Twain in Hartford, CT.
Mr. Strasbaugh, you going to get into the history of musical theatre in this period and slightly post-Civil War? Tammany Hall is going to be torn down to build another ugly office building. Whoop. The original Tammany Hall was where the Con Ed Building is on 14th street. Also where Tony Pastor's original Vaudeville was. I like that whole Kill Henry Sugar album - it's on Swing Back And Down, isn't it? Oh, there - you've got it on the playlist now. Ok Irwin. You're gonna take terry gross job. She can't go on forever. I tuned in just before the interview started. Weird: The book's new, right? Why do I have such a feeling a deja vu about this interview. I've heard Irwin interviewing Strausbaugh before, but this one's got to be new, right? Maybe it's just familiarity w the subject matter, and over a matter of years some material's bound to come up repeatedly. Or just the sound of their voices together. If you go to the Fire Museum on Spring street, you can read about this kind of fire company rivalry. But I think, eventually, you'd choose your company and put a plaque on your house showing which fire company was paid to protect your house. Kind of like having private health insurance before Single Payer which we enjoy today. Not. @ Robert--yes, this is a brand new book; you might be thinking of his earlier book "The Village"? Laura, I might be thinking more than one book back. Maybe I'm just conflating my knowledge of the subject, Mssrs. 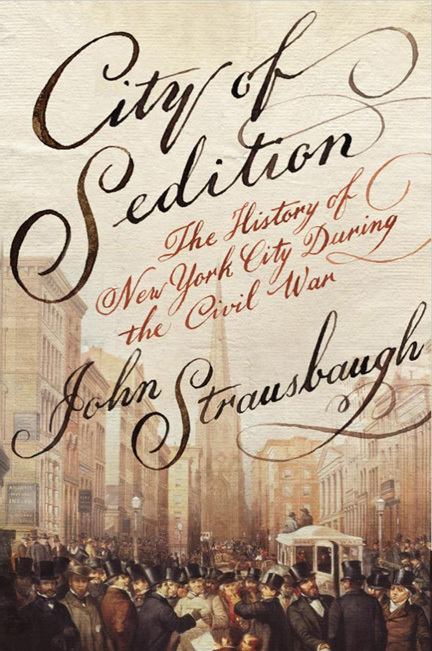 Strausbaugh's & Chusid's voices, and my reading of Strausbaugh in the NY Press decades ago. I really enjoyed reading The Village, so I look forward to this new book!! Augustus Saint Gaudins holed up in the cameo shop where he worked accros from madison square during the draft riots. The pen is mightier than the sword -- unless you take it literally. Then I think I'm keeping my head down. crap. i just missed something interesting. Fantastic interview. Excited to read his books. The Draft Riots at least had some kind of political motivation, but the Astor Place Riot ... was about which actor was better at Shakespeare.(1849). 25 dead, 120 injured. Thanks Irwin and John, that was swell. Webhamster:Wow, what a hot headed audience! You can probably tell I'm a nut about this stuff too . That's because I was born in 1832, but lie about my age. The Old Codger is like that too. thank you w.m. henry for my first genuine chuckle of the day. Petra Haden covered that whole album ("The Who Sell Out") in acappella. The Good Rats. That was amazing. Totally new to me. Rich: 1974, TASTY, their best album. Not a clunker on it. Nice show today, dear Irwin. Thanks for spinning. okay then. electricity's back. caught the tail of that good rats song and it sounded really good, rats. i recorded a concert of theirs broadcast on wnew in the late 80s, even though i wasn't that into them. i still have the 8-track tape...but "phil fleisch" is much better than that was. coel: there's a live Rats show online somewhere, found it a few weeks ago, been meaning to listen. On a quick review, it sounded well-recorded and dates from their prime. Thanks Irwin. i'll look for it. ...and i meant the late 70s actually. i don't even know if they existed in the late 80s. Wonderful show today Irwin,but they always are,so thank you! Please keep playing Herman's Hermits. We all need more of that. oh i missed a "sell out" track too. my 2nd favorite who album. A great show and a great interview today. Thank to you and to Mr. Strausbaugh. That HH song is also from "Both Sides of Herman's Hermits." that's right. i knew i knew that track but i never heard "remind me later". i was confused. Thank you kindly Irwin - I actually tried to find the publishing for Until the Swelling Goes Down (on Harry Fox you can do a search if you're interested in who owns the publishing or wrote the song!